When I was putting together my thoughts for this blog, I thought about what I want to teach you. More than anything I don’t want you to be afraid to try. It sort of took me back to the Sound of Music and “…Let’s start at the very beginning…”. Well it is a very good place to start. So with that in mind I am going to encourage you to try something new at least once a month. I’m not talking about anything outrageous or complicated. It can be quite easy. As a matter of fact some of my best and most praised recipes are E-A-S-Y. And as any infant knows you must walk before you run, bet everybody is SOOO impressed when you walk. So let’s keep it simple. Let’s make Whipped Cream. 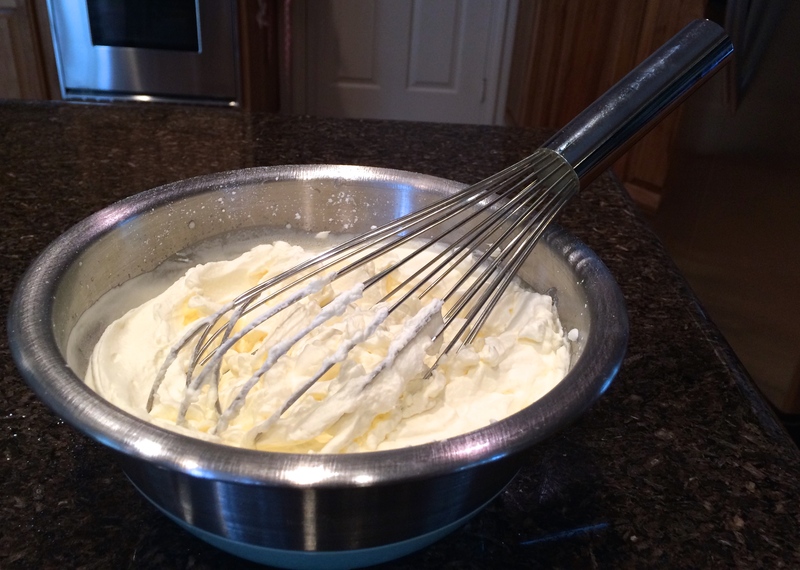 Chances are if you are reading this blog you may know how to make whipped cream. You also know how easy it is to buy a can of Reddi Whip or a tub of Cool Whip. Whatever level you are at let’s take it up a notch! Are you looking for the rest of the ingredients? Nope that’s it. Of course you can take it further, but let’s start here. Ready? Pour the cream into a metal bowl. Make sure the bowl is col. At the very warmest it should be room temperature. You could chill it for about 5 minutes, if you want. The reason you want the bowl cool is it helps the cream set up faster and cool whip cream is way better than warm. If you live in warm temperature climates, you could consider putting your bowl in another bowl filled with ice, but it is not necessary. 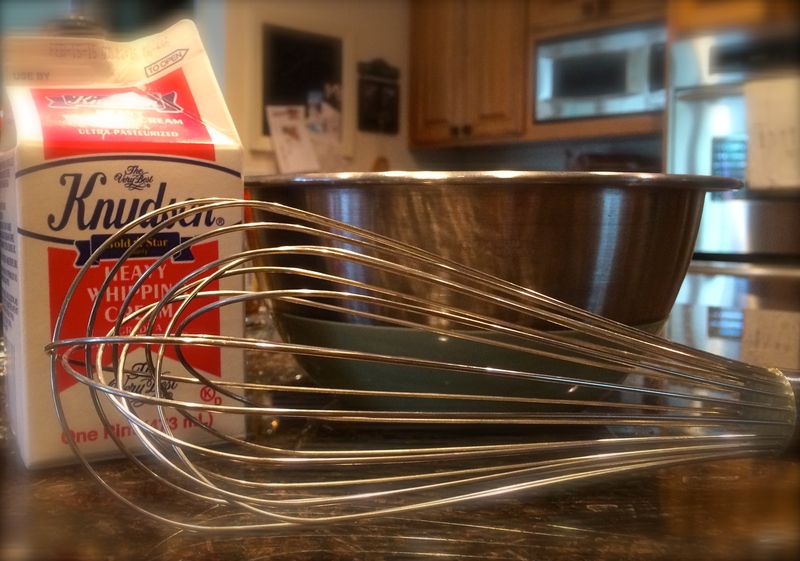 If you are using a whisk, you are going to need a certain amount of stamina and strength. It can be done; this is how they teach it in culinary schools all over the world. You can also use an electric hand or stand mixer. Start out slow and then gradually speed up. You will start to see the cream get thicker and come together. Once it starts to thicken watch it carefully. This is the only part you must be patient. If it gets too thick or beaten it will start to look like curds or sour milk. It will taste fine but will be unappealing to the eye. Boom! You’re done! Use a big spoon and heap it onto a slice of pie, ice cream or shake. You can jazz it up from there. If you want it sweetened, you have two choices. You can buy the cream pre-sweetened, “Cook’s” make a nice one, or you add sugar yourself. I personally prefer powdered sugar. The cornstarch in powdered sugar adds a stabilizing quality to the cream. You can use granulated though. I start with 1 tablespoon and gradually add in as much as needed. Be sure to taste after each addition. Sweetness is a personal preference as well. You can also add a teaspoon of vanilla for a little depth of flavor. For serving, you can spoon it on or you can put it in a piping bag with a star tip and you will have an elegant presentation. However, you do it, make it yours! This was our first but not our last, Try Something New project. Don’t be afraid. As the ad says… Just Do It!